When journalists sat down to ask Kevin Peesker questions on Wednesday – their first opportunity since he took over the top job at Microsoft Canada – he had a couple of questions for them. 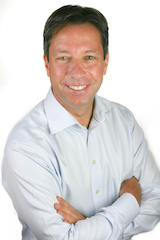 When Saskatoon-born Peesker was named president of Microsoft Canada in early September, he became the first Canadian to hold that title since 2004. He took up the post after spending 14 years (two in Ireland, 12 in Canada) with Dell. In Wednesday’s Q&A with reporters in Toronto, Peesker said the global tech community is paying more attention to Canada these days. He cited Microsoft’s January acquisition of Maluuba, an artificial intelligence (AI) startup based in Waterloo and Montreal. Microsoft colleague Toni Townes-Whitley, sitting across from Peesker, agreed with his observation. 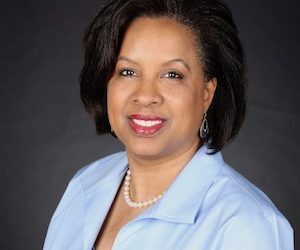 “I think Canada’s the place to be,” declared Townes-Whitley, corporate VP of worldwide public sector and industry at Microsoft. Montreal, in particular, seems to have piqued Microsoft’s interest in Canada. Besides the Maluuba deal, Microsoft has also invested $1 million in Montreal AI incubator Element AI and donated $6 million over five years to fund AI research at McGill University and Université de Montreal. Peesker was also glad to talk up Canada’s Toronto/Waterloo tech corridor at a recent gathering of executives from Silicon Valley heavyweights like Uber and Tesla. “Is it the Silicon Valley of the north or not?” Peesker recalled the execs asking. They ultimately agreed “there needed to be scale around industry, educational institutions and startups to replicate or improve upon the Silicon Valley ethos we’ve seen executed down there,” he said. He hinted on Wednesday that Canadian governments can also play a key role in extending the tech success of Toronto and Waterloo beyond southern Ontario to other parts of Canada. “When we were looking for where to invest in AI next, it was wonderful to have the prime minister in Vancouver launching an AI research centre there,” Peesker said. He was referring to Prime Minister Justin Trudeau, who attended the opening of the Microsoft Canada Excellence Centre in June 2016. Microsoft plans to create up to 450 development jobs at the new Vancouver lab. The company said the facility’s close proximity to its world headquarters near Seattle will boost cross-border innovation at Microsoft. 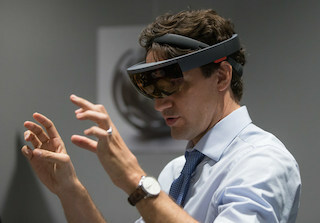 Prime Minister Justin Trudeau using a HoloLens headset at the opening of Microsoft’s new Vancouver lab in June 2016. Collaboration between developers in Vancouver and the U.S. has already resulted in two new Microsoft apps. Seeing AI, an app for smartphones and smart glasses that helps visually impaired people navigate their surroundings, was created by Canadian university students during a Microsoft internship in Vancouver. The other app – now integrated into Microsoft’s OneNote offering – helps kids with language barriers and learning disabilities learn to read; it was developed by OneNote team members based in Vancouver. Still getting his feet wet at Microsoft, Peesker didn’t unveil any company announcements on Wednesday. But he and Townes-Whitley did shed a bit of light on some of the firm’s priorities right now, both in Canada and globally. Blockchain: Peesker’s roundtable with journalists was part of SIBOS, an annual global conference on banking and financial services taking place in Toronto this week. Townes-Whitley said Microsoft views blockchain as applicable to many more sectors than just finservices, and suggested it will revolutionize the government/public sector as well as private sector industries. She added, however, that IT providers must constantly balance data privacy with escalating customer demands for a better experience. She pointed to a global Accenture survey that found 65 per cent of consumers are willing to provide more of their personal data to financial services companies in exchange for financial services that are more personalized for them. AI ethics: “Our position at Microsoft is (toward) augmented AI, not AI in replacement of humans,” Townes-Whitley said. In light of research suggesting some AI algorithms reflect the racial, gender or other biases of their developers, she said Microsoft CEO Satya Nadella has created a committee to explore ethics in AI technology.